We consider the training of indigenous missionaries, pastors, and evangelists to be one of the greatest privileges entrusted to us by God. This training takes its most personal form in our annual and semi-annual Bible conferences that are held in the countries where it is most needed. Throughout the year, we are able to have an influence on the theology and praxis of hundreds of worthy laborers who have often not had the privilege of studying in a formal Bible institute or seminary. We usually hold a conference for four days, and the main areas of concentration are hermeneutics, systematic theology, expository preaching, and pastoral ministry. At the moment, we have been blessed with a wide group of pastors, teachers, and evangelists from the United States who comprise our conference teams. They are men who have given themselves to know God and His Word. The conference speakers see this work as a privilege and either pay their own way or are sponsored by their home church. Such dedication on their part allows us to continue directing the greater part of the donations entrusted to us to the needs of the indigenous missionary. The HeartCry conferences function as a double blessing in that the teachers are often as blessed and encouraged as the indigenous missionaries they have taught. The Gospel ministry in the United States can often be a source of discouragment for the faithful pastor who sees little hunger for the Word among his congregants. It is so very encouraging for him to teach the Word to a hundred or more laborers who sit on the edge of their seats to hear every word and who soak up truth with overwhelming gratitude and joy. Kabwata Baptist Church's annual conference for workers throughout Africa. 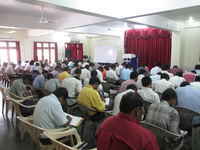 HeartCry Conference with pastors and missionaries in North India. 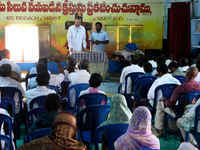 HeartCry Bible Conference in South India. HeartCry Conference in southwest Nepal. HeartCry Bible Conference in northern Nepal. HeartCry Conference with our missionaries in Romania. Conrad Mbewe from Zambia preaching to HeartCry workers in Eastern Europe. Charles Leiter (left) and Bob Jennings at a HeartCry Conference in Romania. Training HeartCry missionaries in Ukraine with Jim Elliff. Paul Washer teaching university students in Turkey. Paul Washer teaching the Gospel in Israel. Hector Morrison of Highland Theological College lectures to pastors in Belarus. Pastors in the Irkutsk region of Siberia attend a HeartCry Conference. 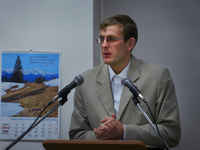 HeartCry Missionary Maxim Manakov preaching during the conference in Irkutsk. Pastors in Irkutsk, Siberia discussing the truths that they were learning. 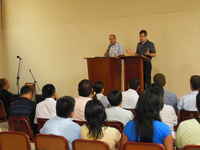 Bible Conference for pastors and leaders in northern Peru. Paul Washer teaching pastors on the doctrine of Propitiation. A makeshift roof to block the hot sun in northern Peru. 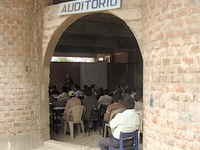 Pastors listening attentively in an outdoor classroom in northern Peru. John Snyder teaching at a HeartCry Bible conference in Lima, Peru. Paul Washer teaching a small group of HeartCry missionaries in Lima, Peru.